To celebrate this weekend’s release of the highly-anticipated Avengers: Endgame, LyricFind and Deezer put together an infographic for the most-mentioned Avengers characters in song lyrics and the top streamed Avengers songs across the globe. 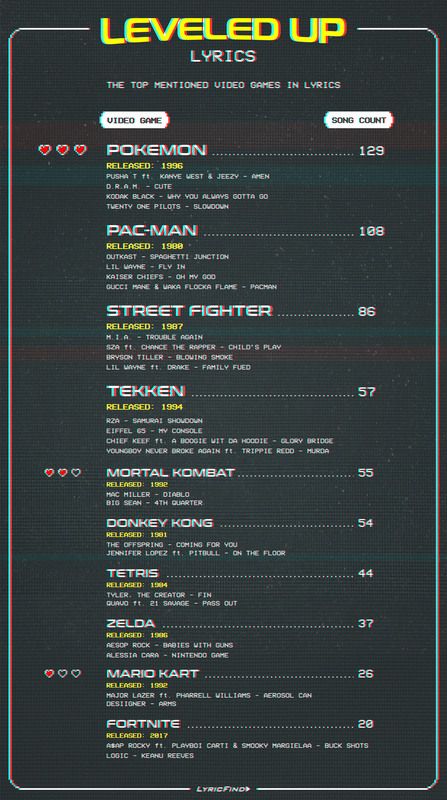 The Hulk takes the crown for the most mentions in song lyrics at 182, followed by Iron Man at 67 and Black Panther at 44. Meanwhile, Guns N’ Roses’ “Paradise City” is one of the most streamed songs that mention an Avengers character, tallying over 3 million streams. Check out the rest of the results in LyricFind and Deezer’s infographic. Deezer connects 14 million monthly active users around the world to 53 million tracks. Available in over 180 countries worldwide, Deezer gives instant access to one of the largest and most diverse global music streaming catalog on any device. Deezer is the only music streaming service with Flow, the unique mix of all your old favorites and new recommendations in one ever-changing stream. Based on an intuitive, proprietary algorithm and created by people who love music, it’s the only place to hear all your music back-to-back with fresh discoveries tailored to you. Deezer is available on your favorite device, including smartphone, tablet, PC, laptop, home sound system, connected car or smart TV. With 4/20 just around the corner, cannabis fans everywhere are getting ready to enjoy their favorite day. 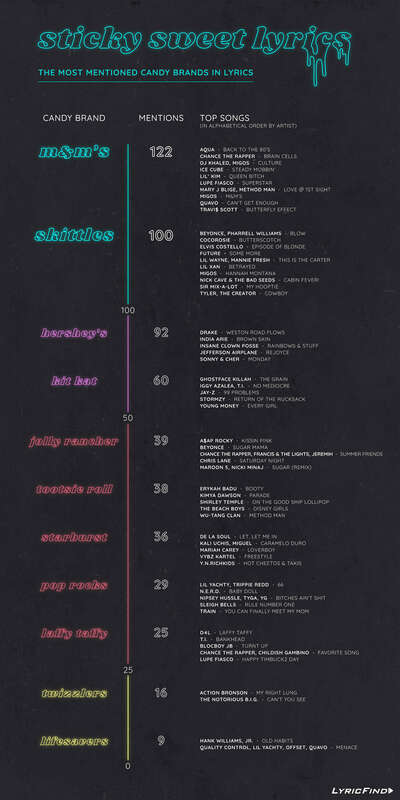 LyricFind put together an infographic to provide one more way to celebrate the day, by compiling the top weed name-drops in music. Marijuana is the most name-dropped term for weed in lyrics, with 774 mentions in songs like Beck’s “Nitemare Hippy Girl” and Frank Ocean’s “Nights.” Kush followed closely with 720 song mentions, and Cannabis rounded out the top three with 401 mentions. Check out how the rest of the weed terms stack up in LyricFind’s infographic. The NBA playoffs are here, and everyone’s asking the big questions: Who can beat Golden State? Who will be the postseason standout? And most importantly, which teams are name-dropped the most in music? To celebrate the arrival of the playoffs, LyricFind has pulled together data for the most mentioned teams and players among playoff qualifiers, with name-drops coming from music’s biggest artists, from Drake to Migos and Lil Wayne. The Golden State Warriors take the crown with 39 song mentions, with the Boston Celtics and Detroit Pistons following closely at 31 and 30 mentions, respectively. Golden State’s Steph Curry leads the way for the most name-dropped player currently in the playoffs with 56 song mentions, followed by Houston’s Chris Paul with 47. Check out Lyricfind’s infographic to see the rest of the results. LyricFind has opened offices in two key regions for the global music business: Morocco and Vietnam. These new offices are the latest in several moves to grow the company’s global footprint, as the leading source of licensed lyrics. “LyricFind’s goal has been to expand and diversify our lyric coverage across the world and be able to service as many territories as possible,” says Darryl Ballantyne, Founder & CEO at LyricFind, “and our new offices in Vietnam and Morocco are the next logical steps toward that goal. LyricFind’s global expertise and extensive catalog of lyrics make us natural partners for the music streaming services and licensing organizations that are coming into their own in markets across the world.” This international range positions LyricFind to license lyrics for hits that reach around the globe as well as locally popular music in an increasing number of markets. LyricFind takes international business savvy and linguistic expertise seriously. In 2018, LyricFind retained expert regional consultants in Japan, Germany, and Brazil to assist the publishing team in acquiring new licensing partnerships. LyricFind also established partnerships with important publishing and PRO players on two continents: Capasso, which covers 38 countries in sub-Saharan Africa, and UBC in Brazil. LyricFind is the world’s leader in licensed lyrics and has licensing from over 5,000 music publishers, including all the majors: Universal Music Publishing Group, Sony/ATV, Warner/Chappell Music Publishing and Kobalt. LyricFind has built a quality-controlled, vetted database of lyrics available for licensing and synchronized technology, servicing clients like Amazon, Google, Deezer, Microsoft, Pandora, and many more. In our new borderless Global music streaming market, Africa is seen by many industry analysts as the next region to drive user growth. LyricFind, the world’s largest lyric licensing company, is excited to further extend their lead with published content, by announcing a blanket deal for the great majority of African markets with CAPASSO, the South African mechanical rights organization. CAPASSO (Composers, Authors and Publishers Association) covers African repertoire from 38 countries, through affiliated African societies. CAPASSO is a mechanical rights licensing agency based in Johannesburg - South Africa, which collects and distributes royalties to its members: music publishers and composers. The deal will mean South Africa and 37 other African countries’ songs will now be fully licensed and monetized by LyricFind across Africa. It also allows all international repertoire to be exhibited and monetized in these countries, legally and with the highest quality standards for the lyrics, the rights and the royalty reporting. The agreement also notably covers legal lyric translations of global music into African and other languages (and vice versa). Legal translations will further help break down language barriers and increase music’s usage, engagement and revenue. LyricFind is the world’s leading lyrics company who power lyric licensing, content and reporting services for Amazon, Deezer, Google, Pandora, iHeart, Microsoft, Pioneer, Anghami, SoundHound, SoundTrack Your Brand and many other websites and streaming services worldwide. With the end of the year just around the corner, LyricFind is announcing the Top 20 Lyric Searches of 2018. Taylor Swift’s “Look What You Made Me Do” rules, topping the list of most-viewed lyrics globally for the year. 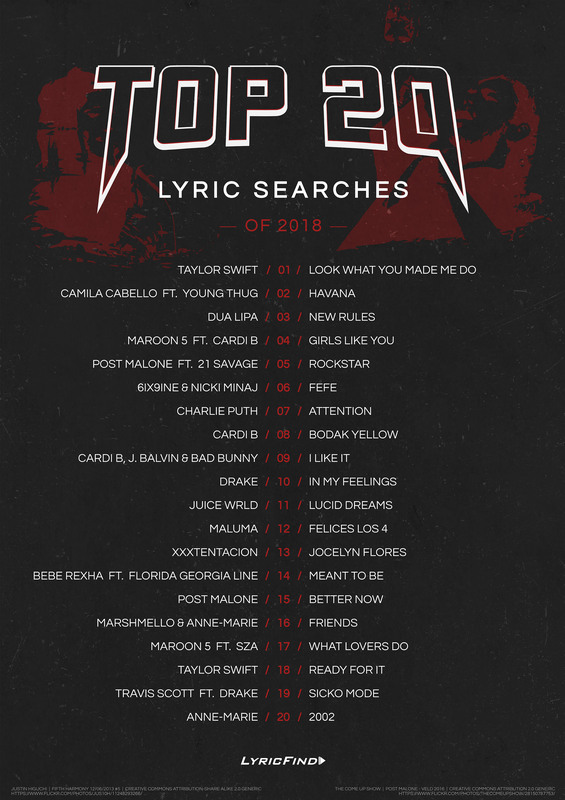 Women led the way on lyric searches this year, with Camila Cabello’s “Havana” and Dua Lipa’s “New Rules” coming in second and third, respectively. Check out the rest of the results in LyricFind’s infographic. 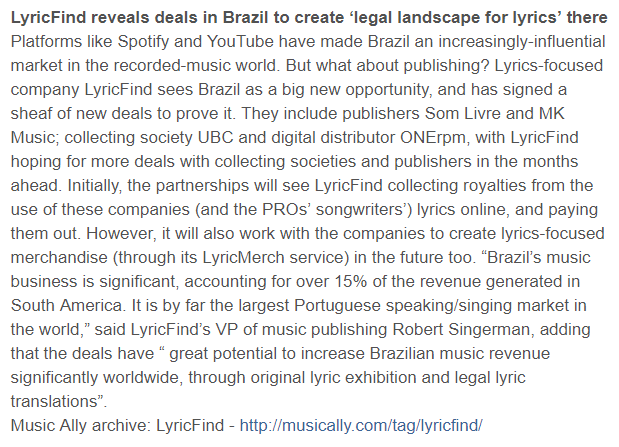 LyricFind seals deals with Brazil’s main publishers and PRO, creates new legally licensed market for Brazilian lyrics. “Lyrics are key elements of the way we experience music, and I am thrilled to be able to work with international partners to increase the opportunities for Brazil’s many writers and publishers,” says Luciana Pegorer, LyricFind’s representative in Brazil. In addition to founding her own music company, Pegorer spent seven years at Warner Music Brasil and served as President for the Brazilian Independent Music Association, as well as on boards at WIN and Merlin. She and Singerman have collaborated extensively to build substantive ties between Brazilian and international music professionals and companies. Singerman will be speaking on a panel, “Opportunities for digital music on social media and other services,” on October 26, 2018 at Music Trends Brasil in Rio de Janeiro, the music conference founded by Pegorer that will feature speakers from companies active in the music and tech space, including Twitter, Instagram/Facebook, and more. With Halloween just around the corner, everyone’s favorite candy brand is top of mind - from Hershey bars to Laffy Taffy and everything in between. Indulging in the candy craze, LyricFind has created an infographic listing the most mentioned candy brands in song lyrics. In ranking the top 12 candy brands, M&M's takes first place with 122 song mentions while Skittles follows closely at 100 mentions. Check out LyricFind's infographic to see the rest of the results and top songs mentioning these brands. From Beyonce to The Beach Boys, almost everyone's got some kind of sweet tooth. 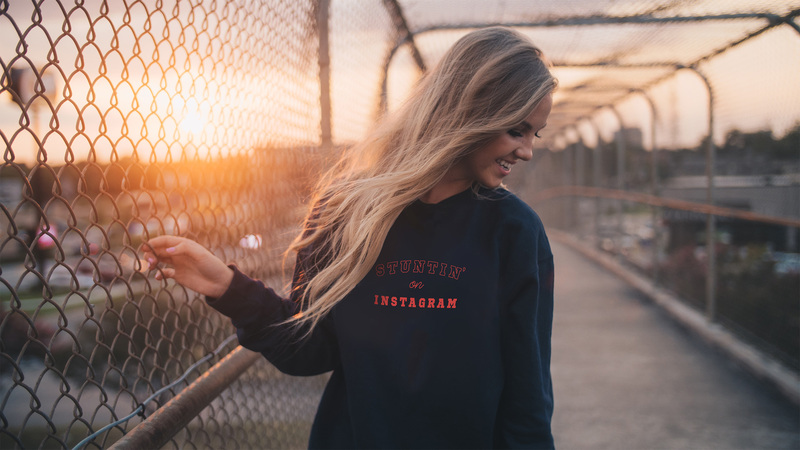 Whether you’re looking for the perfect gift for the musician, the athlete, or the Instagram “socialite” in your life, LyricMerch has you covered. 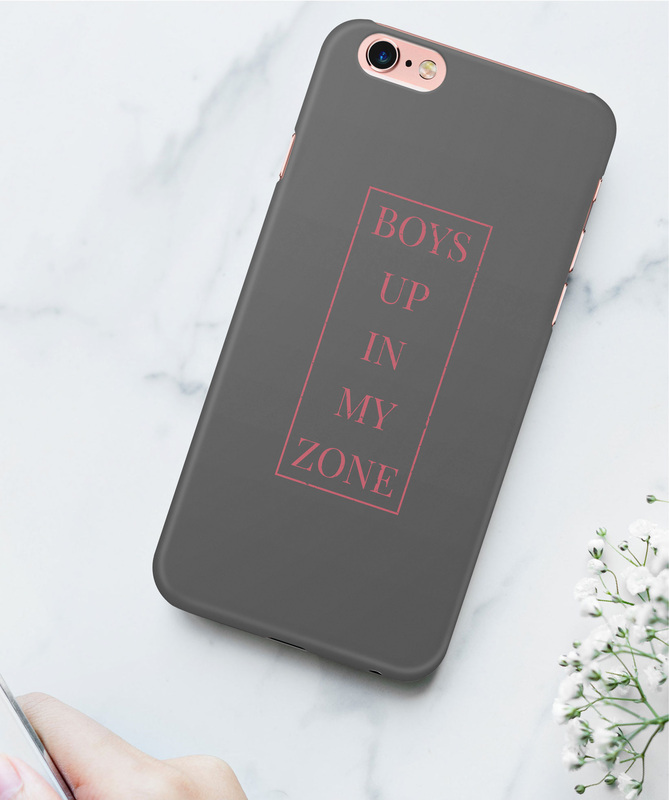 Offering unique apparel and accessories customized with professionally made song lyric designs, LyricMerch has the perfect gift for your AC/DC rocker dad, your Bruno Mars-obsessed best friend, or your sister who lives by every word Beyonce sings. 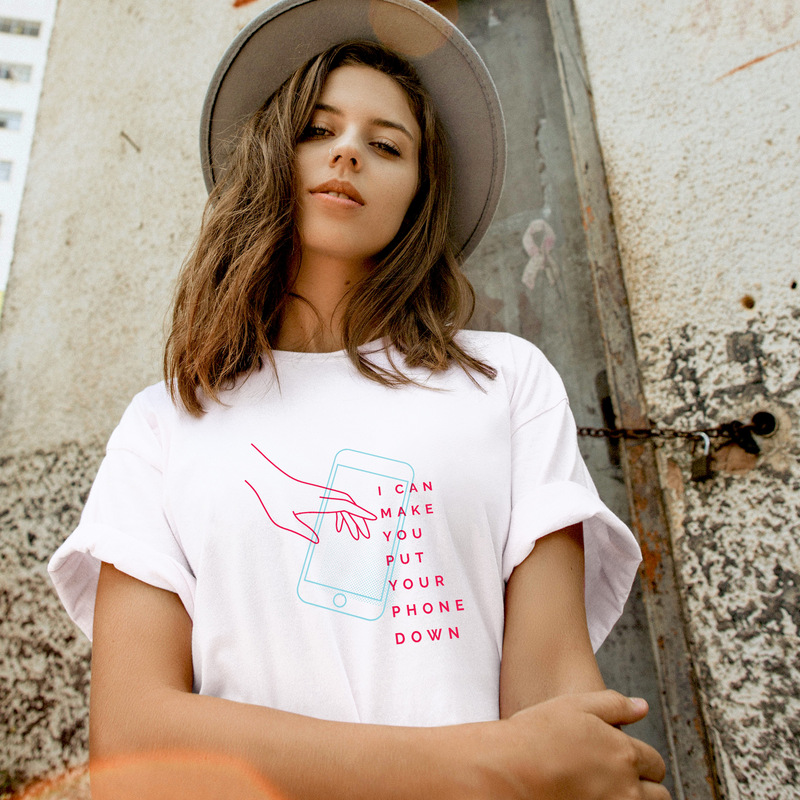 LyricMerch lets you wear your favorite lyrics on t-shirts, hoodies, crewnecks, long sleeve tees, and more - and does so legally by giving back a significant percentage of proceeds to your favorite songwriters and artists. 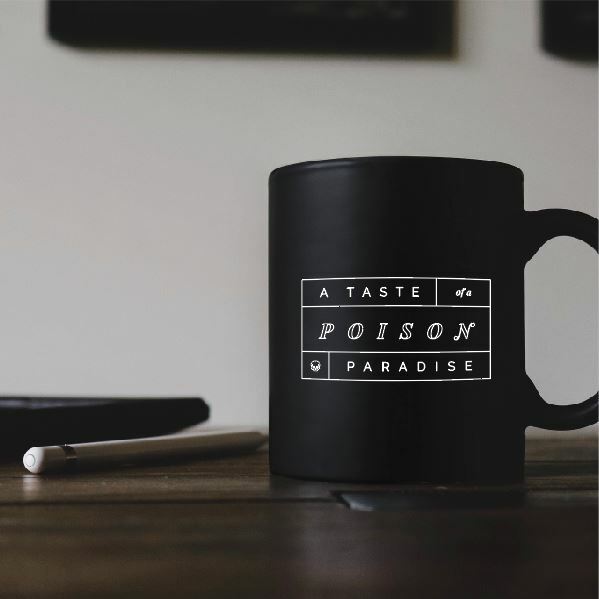 Their pre-made designs are created to complement the lyrics fans have grown to love - providing something fun for all the different people in your life. If the 800+ designs they have online don’t fit what you’re looking for, you can also customize your own! 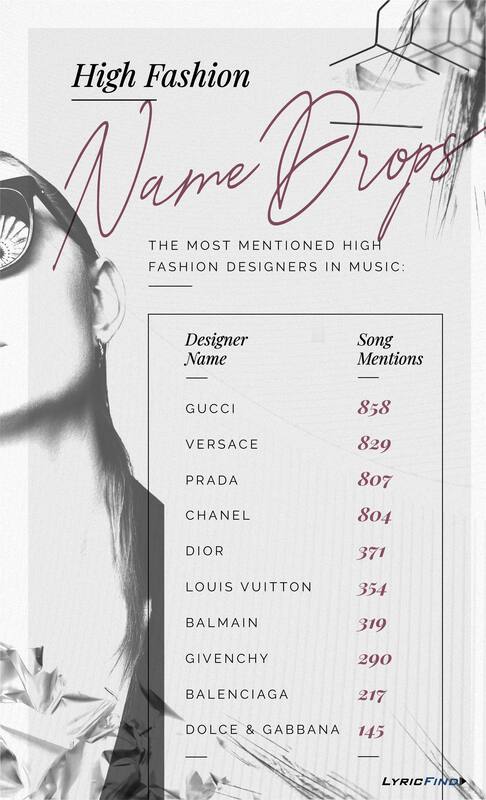 With New York Fashion Week upon us, LyricFind has put together an infographic to showcase the most name-dropped high fashion designers in music. Gucci rules the runway with 858 song mentions, while Versace is a close runner up with 829. Prada rounds out the podium with 807 mentions. See the rest of the top 10 results in LyricFind’s infographic. LyricFind has pulled the summer’s most searched for lyrics. The results? 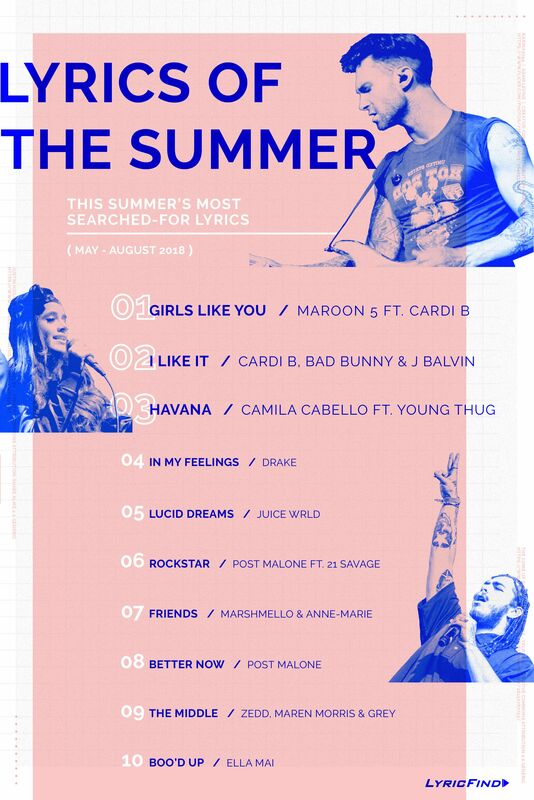 Cardi B rules, locking in the top two most searched for songs of the summer. Her feature on Maroon 5’s “Girls Like You” lands at number one while her smash hit “I Like It" grabs the number two spot. 05/07/2018, Who are Rap's Biggest Momma's Boys? 05/07/201805/07/2018, Who are Rap's Biggest Momma's Boys? Who are Rap's Biggest Momma's Boys? 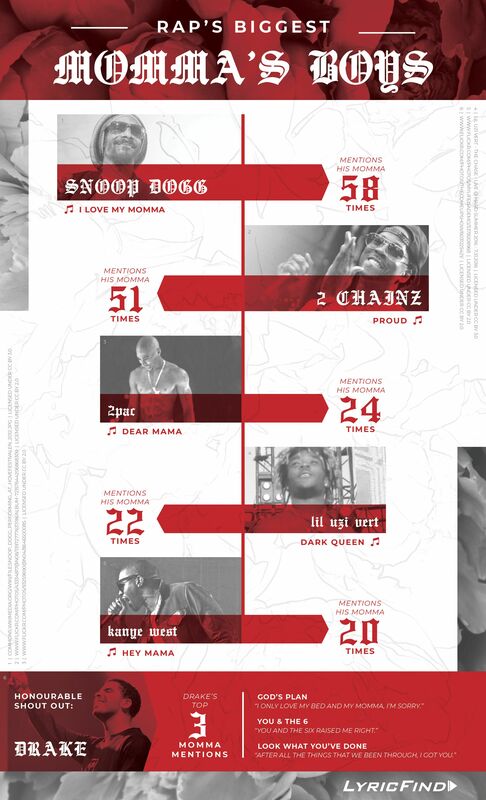 This year, in honor of Mother's Day, LyricFind put together this infographic of the most momma mentions, or "mom-drops" in hip-hop music. Who are rap music's biggest momma's boys? Snoop Dogg takes the lead with 58 mentions of his mother. Runner up is 2 Chainz, who raps about his momma 51 times. In third place is 2Pac, with 24 mom-drops. See the the top 5 results, and an honorable mention in LyricFind's infographic. LyricFind's recently launched service, LyricMerch is carrying on the hip-hop Mother's Day theme with their very own Mother's Day collection. LyricFind, the World’s largest lyric licensing service, is proud to announce its new partnership with UK record labels association, the BPI. This collaboration will enable the BPI to utilise fully licensed lyrics across all of its marketing and social media initiatives, particularly in relation to the BRIT Awards, the Mercury Prize and its Platinum, Gold and Silver sales certifications. In licensing lyric displays, LyricFind will guarantee the legal use of artists’ work while contributing royalties to songwriters and rightsholders. So when the BPI or one of its associated organisations license a lyric, LyricFind will ensure that rightsholders receive due payment. As part of this agreement, lyrics will be featured on The BRIT Awards and Mercury Prize social platforms leading up to and during both events. The BRIT Awards 2018 with Mastercard will be broadcast live on ITV at 8pm GMT on February 21st, 2018 and streamed worldwide outside of the UK on the official BRIT Awards YouTube channel. This partnership is the latest in LyricFind’s company mission to innovate and add value to creators’ lyrics in the digital realm and beyond, and follows on from LyricFind’s partnership with The Recording Academy in 2016. 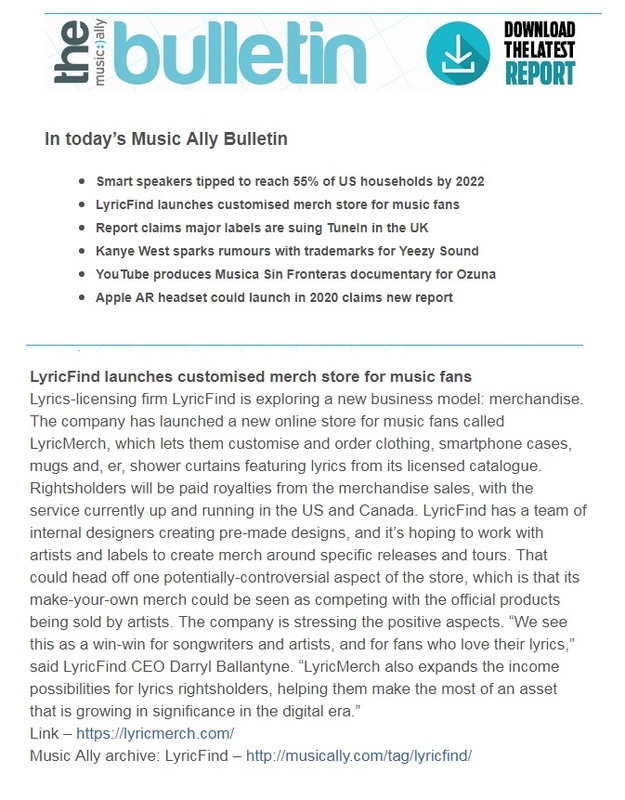 The global lyrics licensing market leader LyricFind, also collaborates with music industry media authority Billboard on the first-ever lyric-driven charts (LyricFind Global and LyricFind US), Record of The Day for the LyricFind UK Chart, and The Music Network in Australia for the Australian Version. LyricFind has licensing from over 4,000 music publishers, including all the majors: Universal Music Publishing Group, Sony-ATV, Warner/Chappell Music Publishing and Kobalt – and has also built a quality-controlled, verified database of those lyrics available for licensing and synchronised technology. This year LyricFind is also launching the world’s first verified and licensed lyric translations for thousands of top titles in dozens of appropriate languages. Behind-the-scenes, LyricFind also tracks, reports, and pays royalties to publishers on a song-by-song and territory-by-territory basis. Whether you are single or taken, there’s a Valentine’s Day anthem out there for you. 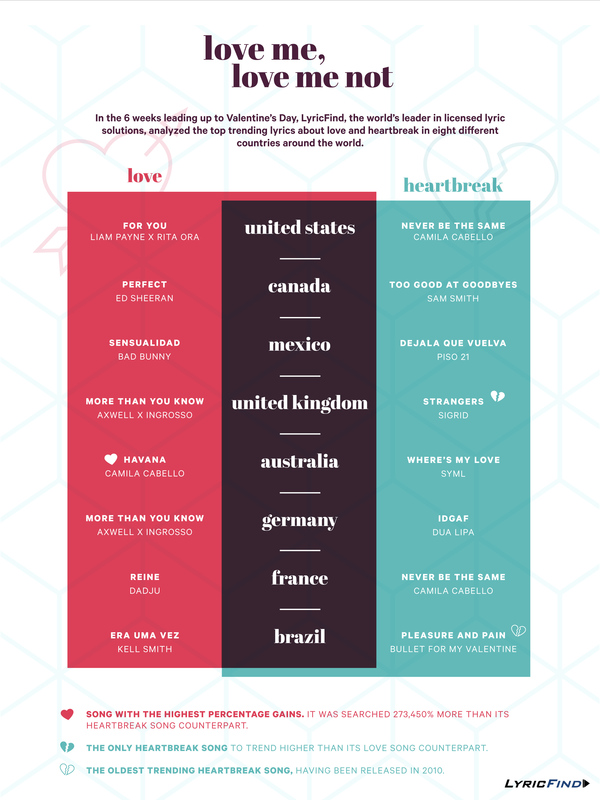 This year, in the weeks leading up to Valentine’s Day, LyricFind has taken a look at top trending lyrics about love and heartbreak around the world. Love is in the air in Australia, where Camila Cabello’s Havana has the highest percentage gains. The song was searched 273,450% more than its heartbreak song counterpart, Where’s My Love, by SYML. However, in the United Kingdom, breaking up seems to be this year’s Valentine’s Day theme, with Strangers by Sigrid trending higher than its love-song counterpart, More Than You Know by Axwell /\ Ingrosso. No matter what you’re feeling this Valentine’s Day, let the lyrical power of a song speak to you. Chester Bennington, Chris Cornell, Prince, David Bowie and just recently Glen Campbell. All deaths within the past year or so that have devastated fans. This series of deaths has increased attention to these artists’ catalogs tenfold and revealed enlightening data related to the ways in which fans choose to honor and remember these recently deceased artists. One such way is reminiscing over lyrics. The recent passing of Chester Bennington had Linkin Park storming onto the LyricFind Billboard charts, securing 13 of the top 15 spots on the U.S. chart, including the entire top 10, and nine of the top 10 spots on the Global list. Based on web searches tracked by LyricFind, the highest surge in lyric searches happens the day after an artist passes. Fan searches for lyrics of Bowie songs increased 1,044% the day after he died compared to the day prior. More than Harry Styles, Miley Cyrus, or Bruno Mars, Billboard U.S. and Global Lyrics charts (powered by LyricFind) displayed Soundgarden and Audioslave in seven of the top 10 spots immediately following Chris Cornell’s death. “Fell On Black Days” had a 25,542% increase in lyric searches alone. Even three weeks after each respective artist’s death, lyric searches remain well above the average search for lyrics before their death. Three weeks after Bowie died, searches remained 234% higher than the average search that occurred before his death. The way fans engage with their favorite artists during the grieving process says a lot about how they connect with the artform. As to the types of songs fans search for while mourning these losses, there seems to be a direct correlation to the death itself. The day after Prince’s death (April 22, 2016), “Sometimes It Snows In April” experienced a 454,750% increase. And following Chester Bennington’s suicide, Linkin Park’s “Shadow of the Day,” a song about goodbyes, experienced a 10,431% increase. “Lyrics offer an intimate glimpse into emotions and stories behind the hits. After an artist passes away, experiencing the lyrics to their songs, according to the data, seems to be one of the more popular ways to mark their loss,” says Darryl Ballantyne, Founder and CEO of LyricFind. Include lyrics on your website. You can create a whole page dedicated to lyrics, or even offer a downloadable PDF for fans, in exchange for an email. Use lyrics on social media to engage fans. Include lyric snippets in your social media posts and tweets, when you share a video or audio track, when you post a picture from a gig, rehearsal, studio session, or epic brunch. Post playful photos of your lyrics to Instagram and social media. Post-its, flyers, chalk… they all suggest quirky, fun ways to put your lyrics out there. Need something more serious? Try your hand at something more calligraphic, or track down a letterpress and commission a few printed cards. Make lyric videos to promote your new song. Lots of bands with big marketing budgets are opting out of the big produced video, and looking for a simpler way. Indie musicians can, too. Start with a straightforward lyric video. If you’re not a whizz at motion graphics or After Effects, try Superstring. You can also go lo-fi for your lyric video. It can be as simple and impromptu as Bob Dylan’s iconic video for Don’t Look Back. Get out the poster board and markers, gather your friends and get creative. Find approaches that capture your artistic aesthetic and that feature your words. Get your lyrics into the publishing pipeline (and onto streaming platforms and other services). Publishing has opened up and is now accessible to artists at all stages of their careers, thanks to aggregators like The Harry Fox Agency or Songtrust. As LyricFind works directly with these aggregators (and many more), it makes it easier for your lyrics to become discoverable through platforms like Apple, Deezer, Shazam, and MetroLyrics. Look into what publishing services your distributor offers. Make the most of them. 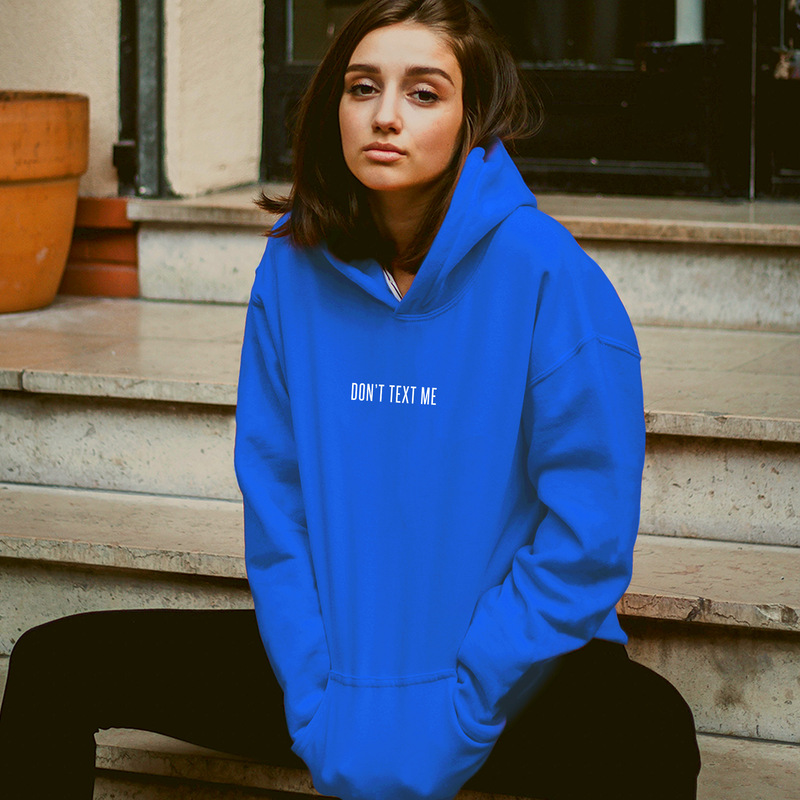 Make merch with your lyrics. Your song’s words would look perfect emblazoned on a t- shirt. Later this year, LyricFind is entering the merch scene with a new on-demand product that allows fans and consumers to print legally licensed lyrics on many kinds of merchandise. Make lyric posters. Remember that letter press idea? Why not print up a few dozen (or thousand) posters or flyer-sized arrangements of popular lines from your fans’ favorite songs? Or find other creative ways to present your lyrics visually. Are you artistically inclined? Are you a doodler? Make an old-school zine-style lyric chapbook for fans, as special thank-yous or perks. Print it, jot some fun notes or little drawings on it, and toss it on the copy machine. Make sheet music or charts for a song. It’s not hard to generate the chords or tablature for many songs. Check out Ultimate Guitar or Fender to make your own sheet music for fans to play along with. The song “Despacito” by Puerto Rican pop artist Luis Fonsi featuring Puerto Rican rapper Daddy Yankee has become a global sensation. The remix, which features Justin Bieber singing in English and Spanish, has dominated Billboard’s Top 100 list for the fifth week, hitting charts worldwide, and is shaping up to be the song of the summer. The chart topper is originally a non-English song, sung in Spanish. Could this be the long awaited watershed moment for non-English hits? It just might be. The majority of global hit songs are English-language songs. The last non-English hit was Gangnam Style by the South Korean musician Psy, powered by a viral video. It’s been a long time since everyone was singing “Macarena” by Los Del Rio, the last song primarily in Spanish to top the Billboard Hot 100 in 1996, which peaked with the Bayside Boys Remix. Hits in other languages seem to be the exception, not the rule. Then why is everyone searching for the lyrics for “Despacito”? Data from LyricFind, the world’s leader in lyric licensing, indicates that the song has garnered over 20 million displays, surpassing all other songs of the summer, including DJ Khaled’s “I’m The One”, which also features Justin Bieber. US fans have made the most searches for the lyrics, followed by Mexico and Germany. When it comes to lyric searches for the remix featuring Justin Bieber, Mexico has made the most searches, followed by Argentina, then the US. 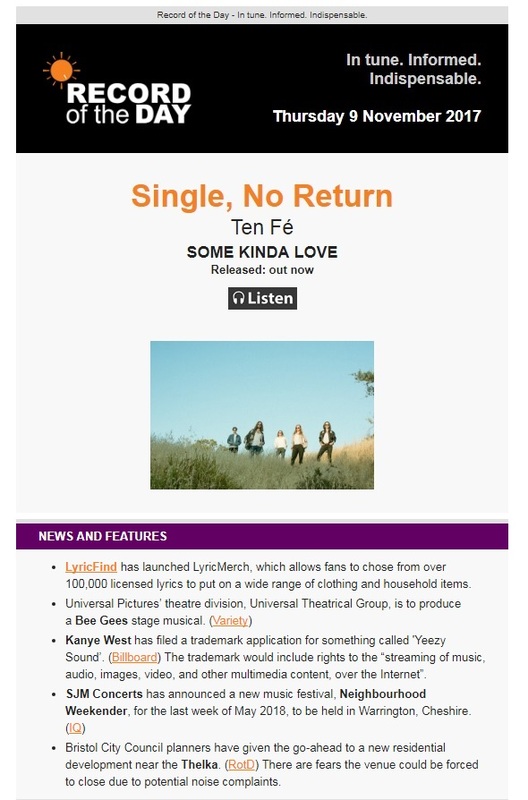 “We think this shows how non-English songs and their lyrics are becoming just as compelling for listeners as English-language songs,” says Robert Singerman, VP of International Publishing at LyricFind. “We’re entering an era where lyric language will become less of an issue.” Tracks will start to speak for themselves--and appear in translations. LyricFind’s translator Raymond Robert has a few tips for interpreting the translation. First of all, “despacito” is a diminutive form of “despacio” meaning slow, which expresses a sense of endearment or intimacy. It could be roughly translated as “nice and slow” or “very slowly.” The song’s chorus may read as abrasive or awkward in English, but in Spanish it is innocent and sweet, and meant to be read figuratively, not literally. The translation of “Sube,” continues Robert, is “go up” or “goes up.” This word is common in pop songs to create a sense of growing energy or hype. And that’s definitely where the song has gone, up, up to the very top. Sube, sube. LyricFind is the world’s leader in licensed lyrics and has licensing from over 4,000 music publishers in 100 countries, including all the majors: Universal Music Publishing Group, Sony/ATV, Warner/Chappell Music Publishing and Kobalt. It has built a quality-controlled, vetted database of lyrics available for licensing and synchronized technology. Behind the scenes, LyricFind tracks, reports, and pays royalties to publishers on a song-by-song and territory-by-territory basis. Austria-based language learning company Linguician (www.linguician.com) is teaming up with the world’s leading lyrics provider LyricFind for one clear reason: Lyrics make it fun and effective to learn and perfect another language. Music has been used as a memory booster since time immemorial, and its power is still in full force. Not only do lyrics have a knack for getting stuck in our heads, but they’re the perfect enhancement to vocabulary acquisition. Linguician, available for free online, with a mobile version expected to launch later this year, harnesses this power elegantly. Users can select from a wide catalog of music videos, picking their favourites in their target language. The service introduces users to the lyrics, letting them learn new words and expressions. It then guides them through fun games that prompt them to fill in the blanks or choose the correct translations all while the language learner moves in time to the beat. "With Linguician, the user can unlock the associative power of music for language acquisition,” explains Alexander Rietzler, Founder and CEO of Linguician. “Learning new vocabularies suddenly becomes possible without feeling the effort." The app’s strongest language is currently English, but it also supports language learning in Spanish, Portuguese, German, Italian, and French. “New videos are being added daily,” adds Rietzler. LyricFind supplies the legal lyrics, giving the platform access to the dozens of languages the company has vetted and licensed from hundreds of publishers around the world. It is an original use of the service’s product, one that shows the full, diverse possibilities for lyrics in the digital age. Linguician is the first platform that offers individualized and personalized language learning content based on music and lyrics. It is dedicated to designing a language learning experience that is as entertaining and playful as possible. The year-end holidays have their own songbook. It’s a favourite time to get together and sing some seasonal classics, or launch into a spirited solo in the car or at the office party. And while we all know the songs, how many of us know all the words? LyricFind is the licensing partner for major search engines, streaming services, lyric websites, and other music platforms across the globe, and gathers data from millions of searches and displays. This year, lyrics have made headlines across the world. From Bob Dylan’s writings being recognized with a Nobel Prize this year, to hip hop lyrics impacting education and the US presidential election, to the recent 2017 GRAMMY Nominations, lyrics continue to have both a huge musical and cultural impact around the world. For 2016’s year in review, LyricFind has rounded up the top lyric displays of 2016. LyricFind is the World's Leader in licensed lyrics, with more than 4,000 music publishers signed and utilized by more than 100 services including Google, Amazon Music, Deezer, Pandora, Shazam, Microsoft and iHeartMedia among many more. The majority of places where you see lyrics online and in your favorite music services are powered by LyricFind. LyricFind also provides four different charts every week, working with Billboard (Global, US charts), Record of the Day (UK) and The Music Network (Australia). Three out of the five songs nominated for a GRAMMY in the Song of the Year category, which honors the songwriter over the actual record itself, find themselves in the top 10 most searched for lyrics of 2016. These include Justin Bieber’s “Love Yourself”, Adele’s “Hello”, and Lukas Graham’s “7 Years”. Earlier this year, Justin Bieber’s “Love Yourself” marked LyricFind’s 15 billionth lyric display, and the company has tracked another 2 billion displays since then. The Recording Academy and LyricFind are continuing their licensing partnership for marketing and social media initiatives. In licensing lyric displays to The Recording Academy, LyricFind guarantees the legal use of artists’ work while contributing royalties to songwriters. LyricFind has had a banner year, creating new markets for its product and forging new partnerships around the world. From Spain to China, and Japan to Brazil, the Toronto-based firm has pushed to make licensed, monetized lyrics part of the music scene everywhere. LyricFind’s partnership with Google not only transformed the way music lovers search for lyrics, but has also made lyrics more accessible and visible across the #1 search platform. You don’t have to understand the voice of the sea to want to sing along. That’s the takeaway from the viral success of “Umino Koe,” a mesmerizing take on fairytale romance, mixing Japanese traditional elements and pop power, by Japanese chart toppers Begin and the haunting voice of singer and actor Kenta Kiritani. Thanks to the world’s leading lyrics provider, LyricFind, and Japanese partner SyncPower, fans everywhere will be able to sing along to a Romanized version of the song. Added to LyricFind’s offerings by popular demand, the phonetic rendering of the Japanese lyrics will be available to clients like Amazon, Deezer, Shazam and many more. When the video for “Umino Koe,” part of a popular fantasy-inspired campaign for mobile company KDDI, hit YouTube in 2015, no one expected it would connect with listeners across the world. It started to rack up views, and then began making waves on iTunes. At writing in October 2016, the number of views on YouTube has climbed to nearly 60,000,000, and the video continues to attract viewers from around the world. “We are thrilled to see people of all different backgrounds enjoying this Japanese song. It’s amazing to be able to connect the world through lyrics and give people the opportunity to experience music in a deeper way,” says Rina Oka, Chief Marketing Officer of SyncPower. SyncPower is a music content production, supply, and distribution company enabling people to fully enjoy music in the digital age. Founded in 2006 and based in Tokyo, SyncPower provides lyric search services, a media player app, and much more. Optimized timestamping for precisely synced lyrics and well-managed programming logic make it a powerful partner to myriad companies and platforms around the globe. LyricFind, the world’s largest lyric licensing service, has partnered with the leading automatic content recognition service provider ACRCloud to integrate its lyrics ID into ACRCloud’s music fingerprinting catalog. With this integration, developers using ACRCloud’s music recognition and radio airplay monitoring services will now be able to conveniently access lyrics directly on ACRCloud's music database without the need to look up lyrics on LyricFind’s database separately. integrated numerous identifiers such as ISRC, UPC, Spotify, iTunes/Apple Music, Youtube, Deezer, Music Story and now LyricFind within its own music database. “We’re excited to partner with ACRCloud and make powering lyrics to their numerous partners as seamless as possible. We look forward to working on many new deals throughout Asia Pacific and beyond withthis partnership,” said Will Mills, LyricFind Chief Revenue Officer. one-stop comprehensive licensed lyrics database access allows our developers to incorporate lyrics in a licensed manner conveniently into their projects via ACRCloud's easy integration,” said Tony Li, Co-Founder of ACRCloud. LyricFind is the world’s leader in licensed lyrics with 100+ clients worldwide including, Google, YouTube, Amazon, Pandora, Deezer, Microsoft, Shazam, SoundHound, The Recording Academy, Billboard and many others. LyricFind licenses from over 4,000 music publishers, including all the majors: Universal Music Publishing Group, Sony/ATV, Warner/Chappell Music Publishing and Kobalt. It has built a quality-controlled, vetted database of lyrics available for licensing and synchronized technology. Behind the scenes, LyricFind tracks, reports, and pays royalties to publishers on a song-by-song and territory-by-territory basis. ACRCloud is a comprehensive automatic content recognition provider that has been ranked #1 in audio fingerprinting technology by the prestigious Music Information Retrieval Evaluation eXchange (MIREX) in 2015. With over 40 million tracks indexed in its music fingerprinting database, ACRCloud offers music recognition solution to partners like Xiaomi, Omusic and Peach amongst others. LyricFind, the world’s leading lyric licensing company, announces today it has delivered its 15 billionth lyric display, with over 4.2 billion of these displays coming in the last year alone. This significant milestone, with a huge rise in last year, demonstrates the importance of lyrics to consumers and the relevance they have within music services. The 15 billionth lyric to be displayed was Justin Bieber’s “Love Yourself”, crossing the milestone threshold in January, 2016. Written by Justin Bieber, Ed Sheeran and Benjamin Levin, the lyrics to “Love Yourself” received more than 3.8 million displays within the month of January alone as it crossed the 15 billion benchmark. Music fans use lyrics to deepen their engagement with the latest songs and to get new perspectives on old favourites. Lyrics search also serves as a discovery method to identify new songs fans may have heard when they were out and about. These emerging songs are highlighted in LyricFind’s weekly LyricFind Charts on Billboard and The Music Network, which rank the top trending lyrics in the U.S., Australia, and Worldwide. With recent deals signed in France, Brazil and Japan to the latest partnership with Google, LyricFind continues to champion the use and value of lyrics by making them more accessible to users around the world all while ensuring songwriters receive proper payment. LyricFind, the world’s largest lyric licensing service, has partnered with Google to expand lyric offerings. Adding lyrics from over 4,000 publishers to Google’s search results and within Google Play Music, LyricFind now provides licensing for lyrics displayed in Google’s search results as well as in the music app. By helping to source lyrics for Google’s search results and Google Play Music, LyricFind continues to demonstrate how lyrics data can be integrated into a variety of services for music discovery and monetization. LyricFind, the world’s leader in lyric licensing, has partnered with Tratore, the biggest distributor for independent music in Brazil since 2002. Now, the more than 5,000 artists on Tratore can have their lyrics displayed on lyrics sites and synchronized with digital music platforms such as Deezer and Shazam. In just a week, 1,000 of Tratore’s artists opted-in to the agreement, bringing more than 5,000 Portuguese lyrics into LyricFind’s ever-expanding database of lyrics, for display worldwide. With recent deals in Japan and France, the company is committed to bringing together the most comprehensive set of legal lyrics in the world, in several languages to 100 countries. Whenever a lyric is searched for via search engines like Google or displayed in a streaming service like Pandora, the rightsholder earns royalties. "We are excited to partner with LyricFind, the leading company in the legal lyrics field. No matter how much the music business landscape changes, one thing remains constant: authors and composers will always own their work and should able to properly monetize it,” notes Bussab. “LyricFind will be an important partner to help our artists achieve this goal." Tratore’s artists can integrate their song lyrics through LyricFind by signing the Digi_Tratore form on Fonomatic, the company’s control panel. The form is intended for musicians who write their own songs and possess all rights to their catalog, as royalty payments will vary by usage. In addition to Tratore, independent Brazilian publishers can also exhibit and monetize their lyrics with LyricFind through ABMI (Brazilian Association of Independent Music) in Rio de Janeiro and Audio Porto, the creative hub in Porto Alegre. The leader in the legal lyrics space, LyricFind has not only amassed licensing from over 4,000 music publishers, including all the majors: Universal Music Publishing Group, Sony-ATV, Warner/Chappell Music Publishing and Kobalt – but has also built a quality-controlled, vetted database of those lyrics available for licensing in 100 countries. Behind the scenes, LyricFind tracks, reports, and pays royalties to those publishers on a song-by-song and territory-by-territory basis. Tratore is Brazil's biggest independent music distributor, commercializing albums, EPs and singles at digital and physical stores since 2002. The company currently holds a catalogue of over 5,000 artists. 06/03/2016, LyricFind noue un partenariat avec la Chambre Syndicale de l’Edition Musicale française (CSDEM) et avec l’expert des métadonnées Music Story, renforçant ainsi sa position sur le marché français des paroles de chansons. 06/03/201606/03/2016, LyricFind noue un partenariat avec la Chambre Syndicale de l’Edition Musicale française (CSDEM) et avec l’expert des métadonnées Music Story, renforçant ainsi sa position sur le marché français des paroles de chansons. LyricFind noue un partenariat avec la Chambre Syndicale de l’Edition Musicale française (CSDEM) et avec l’expert des métadonnées Music Story, renforçant ainsi sa position sur le marché français des paroles de chansons. LyricFind, le leader mondial de la licence de diffusion de paroles de chansons, a signé un accord pour l’exploitation du répertoire des paroles de chansons françaises et parallèlement un accord avec Music Story, le fournisseur de métadonnées de musique, leader du marché. Music Story représentera LyricFind pour son développement commercial en France. Ce partenariat donnera à LyricFind un accès, via la SEAM (Société des Editeurs et Auteurs de Musique), à la Base d’œuvres de l’Édition Musicale (BOEM), base de données légale qui propose un accès en B to B aux paroles de chansons des éditeurs membres de la CSDEM. Music Story sera le représentant exclusif en France de LyricFind pour les clients qui souhaitent obtenir une licence des paroles via LyricFind. Music Story facilitera également la diffusion de ces licences en assurant la distribution des données, la vente et le support technique. Grâce à ce partenariat avec la CSDEM, LyricFind va maintenant pouvoir donner à ses clients l'accès aux paroles de chansons du répertoire français, donnant un réel avantage à ses clients Européens tels que Deezer. « En tant que client LyricFind, nous sommes ravis d’avoir accès aux paroles de la CSDEM tout en pouvant s’appuyer sur des partenaires de confiance comme LyricFind et Music Story » déclare Ludovic Pouilly, SVP Institutional & Music Industry Relations chez Deezer. « L’ajout des paroles de chanson françaises à notre service va sans aucun doute améliorer agréablement l’expérience de nos utilisateurs ». LyricFind est le leader mondial des paroles avec licence et gère aujourd’hui les licences pour plus de 4 000 éditeurs de musique répartis dans 100 pays, incluant toutes les marques majeures : Universal Music Publishing Group, Sony/ATV, Warner/Chappell Music Publishing et Kobalt. LyricFind a construit une base de données faisant l'objet d'un contrôle de qualité strict, intégrant des technologies de gestion de licences et de synchronisation. Au-delà, LyricFind effectue le suivi, rapporte et assure les paiements aux Éditeurs par oeuvre et par territoire d'utilisation. Music Story est un fournisseur de métadonnées de musique. L’entreprise effectue le rapprochement, la désambiguïsation et l'enrichissement des métadonnées des catalogues des producteurs. Elle propose une couverture internationale des données à ses clients plates-formes de la musique digitale, médias et autres professionnels de l’industrie de la musique. Avec cet accord, Music Story ajoute la commercialisation des paroles à son offre et renforce sa valeur ajoutée sur les métadonnées. Ces nouveaux partenariat avec des leaders mondiaux comme LyricFind, Deezer ou des Éditeurs professionnels comme la CSDEM, confirment Music Story en tant partenaire de confiance à l’échelle internationale sur le marché des métadonnées de musique. La CSDEM (Chambre Syndicale de l’Edition Musicale) regroupe plus de 110 membres (Éditeurs français indépendants et majors), elle représente et défend la profession et les intérêts nationaux et internationaux de ses membres, elle assure la promotion, le développement de la musique, et la défense des droits d’auteurs. Les éditeurs de musique réunis au sein de la CSDEM œuvrent depuis plusieurs années pour que les paroles de chansons soient diffusées le plus largement possible dans le respect des droits des créateurs. Ainsi, la CSDEM a développé depuis près de 5 ans une base légale de paroles de chansons (BOEM) les rendant disponibles sur plusieurs sites français, tout en continuant à lutter contre les utilisations illicites de nombreux sites de paroles. LyricFind, the world leader in legal lyric display licensing, has inked a deal to distribute French lyrics, and has signed an agreement with Music Story, the foremost music metadata provider in the market. Music Story will represent LyricFind for Sales and Business Development in France. The partnership will give LyricFind access, through SEAM (French collective management organization dedicated to graphic reproduction rights), to CSDEM’s members extensive lyric catalogue, Base d’Œuvres de l’Edition Musicale (BOEM), a legal lyrics database that makes lyrics accessible to companies who want to use them online to enhance their products and services. Music Story will be the exclusive representative in France for LyricFind clients that wish to obtain song lyrics and their publishing rights. Music Story will also facilitate licensing by ensuring the provision of data, sales and technical support. In its deal, LyricFind will pay royalties to the publishing representative for the use of lyrics. In its partnership with CSDEM, LyricFind will now be able to make additional French lyrics available to its clients, which comes as a great benefit for international clients like music streaming service Deezer who are based in Europe. Music Story is a music metadata provider. The company does the matching, disambiguation and enrichment of producers' metadata catalogues and proposes an international coverage of the data for its customers such as: digital music platforms, medias or professional of the music industry. With this agreement, Music Story will add licensed Lyrics to its offer and reinforce its capability to add value to its music metadata repository. Those new partnerships with main worldwide leaders like LyricFind, Deezer and professional publishers like CSDEM, will highlight the position of Music Story as a reliable international player on the music metadata market. CSDEM (French Music Publishers Association) which is comprised of more than 110 members (French publishing independents and majors) upholds the representation and defence of the profession and the national and international interests of its members, the promotion and development of music, and the defence of authors’ rights. The music publishers united through CSDEM have strived for many years to ensure the utmost circulation of their lyrics while assuring the full respect of their creators’ rights. Out of this, CSDEM developed a legal base gathering lyrics (BOEM) and set up an economic model with various French websites, while fighting against illicit uses of numerous lyrics websites. This agreement (licensing BOEM to LyricFind) opens up new perspectives, as LyricFind is a major international lyrics aggregator, offering a worldwide diffusion to French works. LyricFind, the world's leader in lyric licensing, continues to expand its global presence through a new partnership with Japan-based SyncPower. LyricFind’s business-to-business platform now provides SyncPower with licensing rights to launch their PetitLyrics Player outside of Japan. With 3 million downloads to date and 22 million monthly views, LyricFind’s worldwide licensing will allow SyncPower’s PetitLyrics Player to gain higher traffic and usage rates from users around the globe. LyricFind has been in the business of fusing advanced technology with strong music industry leadership for over a decade. SyncPower now joins LyricFind’s roster of esteemed clients, advancing the charge to provide complete and verified lyric data to countless websites and software applications for lyric searches, music streaming, download services, lyric videos, multilingual song releases, and community forums for lyric annotation. SyncPower, founded in 2006, is one of the largest companies in Asia providing lyrics on a variety of devices, including smartphones and mobile phones, mobile device players, digital stereo players, car navigation systems, and more. “We are excited and honoured to be working with SyncPower to further expand the international field of lyric licensing around the globe,” said LyricFind Vice President of Sales Roy Hennig. SyncPower’s president, Masakazu Tomita, commented, “Our collaboration with LyricFind has allowed us to launch our music lyric apps and services on a global level, which has been a long-pending plan for us. Maximizing the experience and know-how of our services in the Japanese music market, we will expect to be able to distribute more lyrics to more users in cooperation with LyricFind." This winter has been tough on rock stars. Since November, music critics have written obituaries for Scott Weiland of Stone Temple Pilots, Lemmy Kilmister of Motörhead, David Bowie, and Glenn Frey of the Eagles. This series of deaths has, in some cases, increased attention to the artists’ catalogs tenfold and revealed enlightening data related to the ways in which fans choose to honor and remember these recently deceased artists. One such way is reminiscing over lyrics. Based on web searches tracked by LyricFind, the highest surge in lyric searches happens the day after the artist passes. Fan searches for lyrics of Bowie songs increased 1,044% the day after he died compared to the day prior. Lyric searches for songs by the Eagles jumped 429%, Motörhead lyrics searches increased by 107%, and STP lyrics saw the greatest percentage spike in searches at 1,384%. More than Adele, Justin Bieber, or Taylor Swift, this week’s Billboard U.S. and Global Lyrics charts (powered by LyricFind) have seen a race among the recently passed, with the Eagles’ “Hotel California” taking the #1 spot on the U.S. Chart, passing a wide array of Bowie hits that had dominated the top lyric searches since Monday. The Eagles also saw the most immediate surge in lyric searches with 258% more searches taking place on the day of Frey’s death compared to the day before. Even three weeks after each respective artist’s death, lyric searches remain well above the average search for lyrics before their death. Three weeks after Bowie died, searches remained 234% higher than the average search that occurred before his death. STP lyrics were up 109% three weeks after Weiland died compared to before. “Lyrics offer an intimate glimpse into emotions and stories behind the hits. And after an artist passes away, experiencing the lyrics to their songs, according to the data, seems to be one of the more popular ways to mark their loss,” says Darryl Ballantyne, Founder and CEO of LyricFind. LyricFind is the world’s leader in licensed lyrics and has licensing from over 4,000 music publishers, including all the majors: Universal Music Publishing Group, Sony/ATV, Warner/Chappell Music Publishing and Kobalt – and has also built a quality-controlled, vetted database of those lyrics available for licensing and synchronized technology. Behind the scenes, LyricFind tracks, reports, and pays royalties to those publishers on a song-by-song and territory-by-territory basis. The world's leader in lyric licensing, LyricFind has strengthened its licensing partnership with Downtown Music Publishing, a leading music rights management company based in New York City. LyricFind has recently added Downtown’s complete worldwide catalogue of rights, including works by world-renowned artists ranging from John Lennon and Nikki Sixx to One Direction and Sturgill Simpson. This deal enables lyrics from highly-searched, Downtown-represented songwriters to be made available to Deezer, Pandora, Amazon, and hundreds of other music platforms, apps, and websites whose lyrics are powered by LyricFind. LyricFind is the world’s leader in licensed lyrics and has licensing from over 4,000 music publishers, including all the majors: Universal Music Publishing Group, Sony-ATV, Warner/Chappell Music Publishing and Kobalt – and has also built a quality-controlled, vetted database of those lyrics available for licensing and synchronized technology. Behind the scenes, LyricFind tracks, reports, and pays royalties to those publishers on a song-by-song and territory-by-territory basis. Founded in 2007, Downtown Music Publishing is one of the world's leading rights-management firms, with offices in New York, Nashville, Los Angeles, London, and Amsterdam. The company's catalog spans over seven decades of popular music, encompassing some of the world’s most beloved songwriters and artists including The Beatles, John Lennon & Yoko Ono, The Kinks, Randy Newman, Hans Zimmer, Bruce Springsteen, Mötley Crüe, One Direction, Hardwell, Santigold and Carla Bruni. The company also represents such renowned publishing catalogs as Cy Coleman’s Notable Music, the legendary Latin music catalog, Fania, the UK’s Kassner Music, and Germany’s Budde Music. The company's technology platform, Songtrust, powers global royalty collection for over 80,000 individual songwriters as well as companies such as CD Baby, The Orchard and Downtown’s own catalog in over 90 countries around the world. LyricFind, the world’s largest lyric licensing service, is proud to announce its partnership with The Recording Academy® to license lyrics for various marketing and social media initiatives. In licensing lyric displays to The Recording Academy, LyricFind guarantees the legal use of artists’ work while contributing royalties to songwriters. When The Recording Academy and or the GRAMMYs® post a line or snippet from a song, LyricFind ensures that it is being done in accordance with all applicable laws, and that rights-holders receive appropriate compensation. In addition, LyricFind further supports this partnership by covering the royalty expenses for all retweets and reposts of GRAMMY-generated social media material. Lyrics will be featured on GRAMMY platforms leading up to and during the 58th GRAMMY Awards, airing February 15, 2015 at 8/7c on CBS. The partnership is the latest in LyricFind’s energetic push to change the way lyrics function in the music ecosystem, from making deals that span the globe to collaborating with industry touchstone Billboard to create the first-ever lyric-driven charts. The leader in the legal lyrics space, LyricFind has licensing from over 4,000 music publishers, including all the majors: Universal Music Publishing Group, Sony-ATV, Warner/Chappell Music Publishing and Kobalt – and has also built a quality-controlled, vetted database of those lyrics available for licensing and synchronised technology. Behind the scenes, LyricFind tracks, reports, and pays royalties to those publishers on a song-by-song and territory-by-territory basis. The leader in lyric licensing, LyricFind, has signed a deal for the dedicated lyric integration with Plex, a popular, all-in-one personal media solution across home and mobile devices. The Plex music experience allows users to effortlessly stream songs, albums, and playlists from their entire music library to all of their devices, and enriches the playback experience with recommendations, album art, music videos, and now lyrics powered by LyricFind. As of today, millions of Plex users will get access to synchronized lyrics across their mobile apps, including iOS, Android, and Windows, and later this year on Plex’s big screen apps. To access lyrics to songs in your music library, simply click on the lyrics icon while streaming a song, and synchronized lyrics will be integrated into your experience along with the music. LyricFind leads the market of lyric licensing and dominates the space with more than 100 clients including Amazon, Pandora, Deezer, Shazam, Microsoft, Yahoo, HTC and many more. Plex gives you instant access to your media collections—your home videos, photos, music, TV shows, and movies—so you can quickly find and stream what you want to any device, any time. Platforms include Macs, PCs, smartphones, tablets, Xbox and PlayStation gaming consoles, Smart TVs, Roku, Chromecast, Apple TV, Amazon Fire, Nvidia Shield, and more. Whether it’s your movie and TV collection or your music library, Plex makes your media look beautiful by automatically adding movie posters, plot summaries, cover art, and descriptions. Plex also allows you to share it all with your friends and family. For more information, visit http://plex.tv and follow us on Twitter @plex and Facebook at https://www.facebook.com/plexapp. The leader in the legal lyrics space, LyricFind has licensing from over 4,000 music publishers, including all the majors: Universal Music Publishing Group, Sony-ATV, Warner/Chappell Music Publishing and Kobalt – and has also built a quality-controlled, vetted database of those lyrics available for licensing and synchronized technology. Behind the scenes, LyricFind tracks, reports, and pays royalties to those publishers on a song-by-song and territory-by-territory basis. LyricFind, the leader in lyric licensing, announces the launch of two charts, U.S. LyricFind and Global LyricFind to be presented weekly on Billboard.com, the leading global destination for news, charts, trends and innovations in music. “Searching for lyrics is easily one of the largest music discovery methods globally, with billions of annual requests made through our syndicated services alone. And this chart of lyric searches is very powerful data which is set to become one of the leading barometers of future hit records worldwide,” said Will Mills, Chief Revenue Officer, LyricFind. 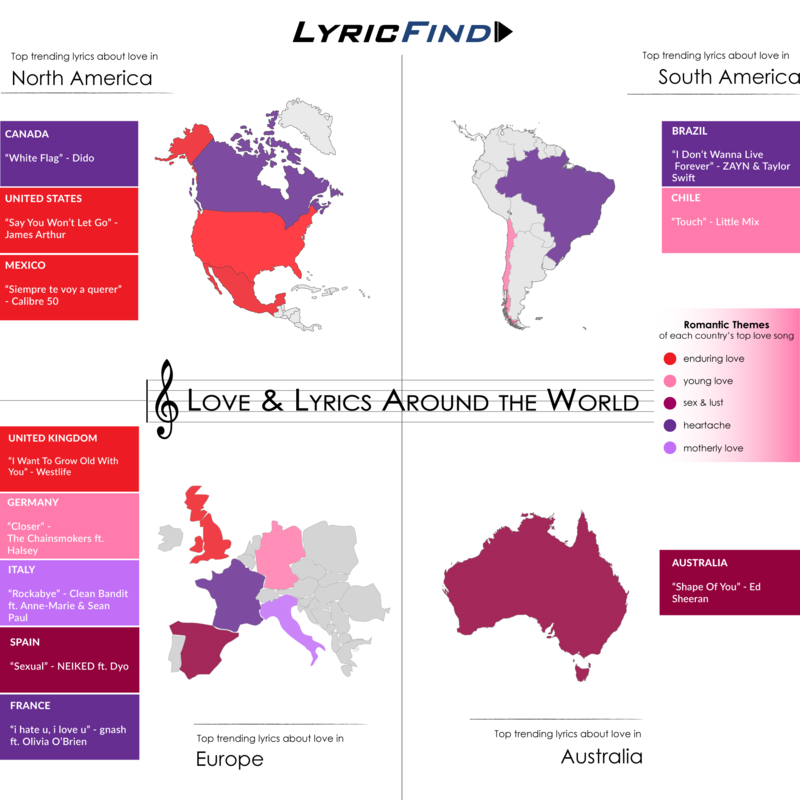 The U.S. LyricFind and Global LyricFind charts rank the top trending lyric inquiries, through LyricFind’s syndication service. LyricFind leads the market of lyric licensing, synchronisation and reporting and dominates the space with more than 100 licensees including Amazon, Pandora, Deezer, Shazam, Microsoft, Yahoo, SoundHound and HTC, among others. In August 2015, Billboard.com hit 14.62 million worldwide monthly uniques, according to comScore. Billboard magazine regularly scores news-making covers with top artists including Lana del Rey, Lady Gaga and Elton John, Selena Gomez, and The Weeknd. The leader in the legal lyrics space, LyricFind has licensing from over 4,000 music publishers, including all the majors: Universal Music Publishing Group, Sony-ATV, Warner/Chappell Music Publishing and Kobalt – and has also built a quality-controlled, vetted database of those lyrics available for licensing and synchronised technology. Behind the scenes, LyricFind tracks, reports, and pays royalties to those publishers on a song-by-song and territory-by-territory basis. Billboard is the world’s most influential music brand, built on the most complete and well-respected database of charts across all music genres. The Billboard charts define success in music. From the iconic Billboard magazine to Billboard.com which is the ultimate consumer-facing destination for millions of passionate music fans, to the industry’s most elite conference series and influencer events including the Power 100 and Women in Music – the Billboard brand has unmatched authority among fans, artists and the industry alike. Billboard has a total social following numbering more than 14.6 million across platforms including Facebook, Twitter, Instagram and YouTube. Billboard magazine has scored major news-generating covers recently including Jimmy Fallon, Azelia Banks, N.W.A, Britney Spears, Florence Welch and Selena Gomez. The leader in international lyric licensing, LyricFind, and R2G, China’s leading digital music distribution company, have just signed an exclusive strategic partnership. The exclusive deal means R2G will represent LyricFind in China for both Business Development and Publisher Relations. 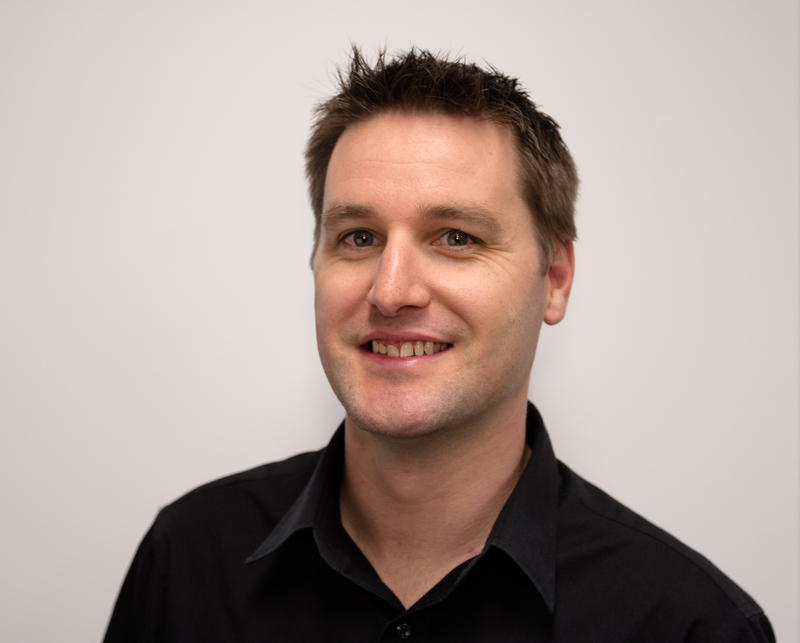 “We have great traction globally and by partnering with R2G as our exclusive agent it will further accelerate our business across the fast growing Chinese music market”, explains Will Mills, LyricFind’s Chief Revenue Officer. With over 10 years of market expertise, R2G has established by far the most extensive digital music coverage in China. As a result, LyricFind’s massive catalog of lyrics in English and several other languages, the most extensive the world, will now also appear on millions of screens and devices across China. R2G is part of China Music Corporation, which is the largest music platform in the world in terms of active user base and is also the largest digital music aggregator and licensing platform in China. R2G’s pragmatic approach to dealing with the copyright environment has enabled many content providers to tap into the Chinese market and has catalysed the powerful trend among major Chinese music services to move out of the shadows and into legal music licensing. This partnership with lyrics is a natural part of that trend, as LyricFind is proving around the planet. The leader in the legal lyrics space, LyricFind has not only amassed licensing from over 4,000 music publishers, including all the majors: Universal Music Publishing Group, Sony-ATV, Warner/Chappell Music Publishing and Kobalt – but has also built a quality-controlled, vetted database of those lyrics available for licensing. Behind the scenes, LyricFind tracks, reports, and pays royalties to those publishers on a song-by-song and territory-by-territory basis. R2G is the leading music distribution service provider with licensing deals across most of the major Service Providers in China, combined with rights from both local and international Content Providers. R2G is also one of the largest distributors of Chinese music to global music services like iTunes, Spotify and Amazon. China Music Corporation (CMC) is not only the largest music platform in the world in terms of active user base with 389 million users, but is also the fastest growing with a share of 73.7% of total internet users in China. As the largest digital music aggregator and licensing platform in China, CMC controls 32% of all licensed music in China. With a multi-platform coverage over mobile, PC and IPTV, CMC’s properties include Kugou, Kuwo, R2G and Rainbow Music which are all leading players in their respective categories. LyricFind, the world’s leader in B2B Lyric Licensing, announces Robert Singerman will be joining the company as VP International Publishing and opening LyricFind’s New York office. With existing major partners like Deezer, Amazon, Shazam, HTC and Microsoft, LyricFind is expanding rapidly worldwide, and Singerman’s appointment will further accelerate the company’s international publishing licensing expansion. Industry veteran Singerman has represented artists as diverse as R.E.M., James Brown, Gypsy Kings, and Fela Kuti, as well as Brazil, France and Europe in music export. He brings a deep understanding of the international publishing industry, a global contact network and a proven track record of success in closing complex rightsholder negotiations. Major music services choose LyricFind because they can get lyrics and synchronized lyric rights covered in a one-stop shop, with quality assurance and best-in-class technology and expertise. This unparalleled service gives music services the widest fully licensed coverage. These services find that LyricFind enables them to use lyrics to drive music discovery, sales, listens, and advertising revenue. 03/13/2015, LyricFind announces Will Mills as Chief Revenue Officer and opens new London office to extend leadership and expansion into Europe and Asia. 03/13/201503/13/2015, LyricFind announces Will Mills as Chief Revenue Officer and opens new London office to extend leadership and expansion into Europe and Asia. LyricFind, the World’s Leader in B2B Lyric Licensing, is expanding further into Europe, and announcing Will Mills will be joining the company as Chief Revenue Officer, based in London. With existing major partners like Deezer, Amazon, HTC and Microsoft, LyricFind is now expanding rapidly worldwide and is opening an office in London to deepen this expansion into Europe and Asia Pacific. Heading this next phase of growth is digital music veteran Will Mills. Mills joins LyricFind from Shazam where he was the most senior music executive there for a decade, most recently as VP Music & Content. During his tenure he was responsible for majority of Shazam’s deals with the global music industry, and led the teams that delivered content ingestion, editorial content, promotions and many other business development initiatives that were critical in Shazam’s massive growth and leadership. Will has co-invented patented technology around Media/Lyric synchronization at Shazam and will be responsible for leading the team on all global business development and sales at LyricFind. Andrew Stess, LyricFind’s previous Chief Revenue Officer, will be remaining on LyricFind’s Board of Directors and also on the Business Development team on the West Coast. “As of 2014, every significant lyric website in English is now licensed or shut down,” proclaims LyricFind CEO Darryl Ballantyne. He would know. The company, which he co-founded, has spent the last decade creating a lyric licensing infrastructure, which launched a new, multi-million dollar revenue stream for publishers and empowers websites and music apps to legally use lyrics for a variety of uses. LyricFind’s business-to-business platform connects the publishers of millions of songs, with websites, hardware companies, and software applications worldwide that want to display or otherwise use lyrics to support advertising, search, or music streaming or download services. On the publishing side, LyricFind represents all the major publishers (Universal, Warner-Chappell, and Sony/ATV) and over three thousand independent publishers worldwide. LyricFind’s exclusive deal to license all Universal lyrics in the English language worldwide makes their offer especially helpful to lyrics websites and applications. Additionally, through partners like the Harry Fox Agency, CSDEM and APRA AMCOS, LyricFind also represents lyric licenses on behalf of foreign publishers around the globe. On the client side, LyricFind licenses and feeds lyrics to several music services including Deezer, Amazon, iHeartRadio, HTC, Shazam, SoundHound, Bing, and many more. LyricFind also licenses and feeds lyrics to lyric websites and apps like LyricsMode, MetroLyrics, LyricsMania, SongMeanings, LyricsFreak, Sing365, and hundreds of others. In an interesting twist of events, not since sheet music’s popularity before recording technology have lyrics become such a significant source of revenue for publishers. It’s only now, thirteen years after the Napster injunction, that the infrastructure for rights management in the digital era makes it possible for developers to use lyrics in new and interesting ways legally. Lyric innovations in recent years include lyric search, lyric videos, multi-lingual song releases, and community forums for lyric annotation. In 2013, LyricFind introduced synchronized lyric delivery, using their timestamp metadata to allow streaming apps to seed a whole new world of innovation. In the final two weeks of 2014, Deezer released their Lyrics feature using LyricFind’s time-stamped lyric offering so that listeners can sing along with their favorite or newly discovered songs. It’s too early to say what creative products will emerge in 2015 with this leading-edge development. One thing that is for sure as we move into a new year: Lyrics will be integrated into more and more apps and websites thanks to the decade-long haul by LyricFind. And 2014 was the turning point for lyrics; the moment when there were no longer any excuses to have lyrics everywhere music shows up.